People are frequently interested in things that will make their lives better, so it's unsurprising that one of the constant arguments for looking after animals, studying them, and the permissions granted under law to conduct research on them, is because there are benefits for people in learning from them. Cats love to groom themselves almost as much as they love to sleep, spending up to one-quarter of their waking hours cleaning their fur. The secret to their self-cleaning success? The spines on their tongues are curved and hollow-tipped. These tiny spines, called papillae, can transfer large amounts of saliva from mouth to fur, which not only cleanses Fluffy down to her skin but also lowers her body temperature as the saliva evaporates. These scoop-shaped papillae are what allow cats to get saliva right down to their skin, which could inspire new approaches to cleaning and depositing fluids on all kinds of hairy, furry, and fuzzy surfaces. So what do you think? - is it acceptable for people to study animals in order to obtain a personal benefit? Chances are that most people are going to be comfortable with observing an animal to learn from it, but at what point do you find the research conducted on animals "unacceptable"? 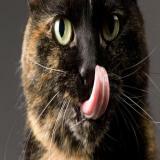 You can read more about the research and potential benefits from looking at cat tongues, by visiting the source page.